DO CHORES HAVE TO BE A CHORE? Children, and even adults, often consider chores a “burden” since they take away time we could spend on activities we enjoy doing and intrude into our “fun” time. However, while few people think ironing shirts is interesting and uplifting, it is something most of us will need to do at some point in our lives, even if only before those first job interviews because, let’s admit it – nobody really irons their clothes all the time. The truth is chores don’t have to be all that horrible, especially if you start participating in them early on and without any negative associations. In fact, a good relationship towards them leads to developing skills useful in adult life and learning how to deal with responsibilities in constructive ways. This is what every parent would want for their child and the good news is there are ways to achieve it. It is possible to have your children help with chores without frustrating them or hearing the usual “Later” whenever you mention anything loosely associated with the household. To help your child develop a good relationship to chores, the most important thing is to start young. A good way to begin having a functional household with all members participating in maintaining it is to have your toddler start caring for their basic hygiene. Teach them to brush their teeth and dress and let them have some independence while doing so. Yes, this means you don’t get to pick out that cute matching outfit, but let your child have a choice about what they wear, as long as it’s not a summer dress… in the middle of winter. When your child starts doing these as a part of their routine, you can gradually add other simple tasks: putting their toys away after playing, making their bed or helping set the table. As your child grows, feel free to add more chores that benefit the entire family, and always show your appreciation for your child’s engagement in them. This will help teach your child autonomy, and also that their needs are not the only ones and that all members of the household should participate in maintaining it. As your child starts taking on more and more chores, you’ll start noticing that some tasks suit their personalities and interests better than others. Encourage them to develop their own methods. As their skills improve, they will feel proud of themselves and chores can actually become a way for them to develop self-esteem. If you have more than one child, it would be smart to delegate different responsibilities to each one. This will not only help you have your house in tip-top condition but will help avoid competition between your children and let them all have a place of their own in the family dynamic. It will also teach them that there is more to being a member of the family than just being born into it. When delegating tasks, try to stay away from social norms about what girls and boys should do. Consider only your child’s individuality and go with that as your main criterion. Another key factor in keeping the drudgery factor out of chores is your own relationship to them. It is completely understandable that you find some tasks tedious or that it is hard for you to clean the grout and hum upbeat tunes while doing so, but at least try not to be extremely negative whenever it’s time to do housework. Think about all the good you will do for your child if you teach them how to accept chores as a part of their everyday lives. Demonstrate that chores are just like any other activity we do daily and that there is no need to complain about ordinary tasks. If you need to occasionally fake enthusiasm for a chore you particularly dislike, it’s probably better than displaying a negative attitude. Maybe it becomes easier and you actually help yourself on your journey to teaching your child important life skills. The third thing to keep in mind while delegating chores is the number of tasks your child has to do. As with any other good thing, moderation is key. Having your child help with chores is all well and good and beneficial for everyone involved, but keep in mind that children need time to study and play, and that chores shouldn’t take up most of their time. If you don’t want your child to become resentful towards all household tasks, don’t make him/her participate in them in all their spare time and try not to use chores as a form of punishment. This often leads to resistance and can have negative effects even later in life. In case you have a child who has already developed a not-so-great relationship with chores, fret not – there are ways to make it better! Of course, take into account everything said in the previous paragraphs, but also show appreciation for any contribution your child makes to the household no matter how minor. If the only thing your child does is occasionally making the bed, mention how great that is that they did that instead of criticizing them for not doing more. Also, keep in mind that we tend to show resistance to activities that are presented as something we must do, so try not to make chores one of those as it will only make the child dislike it even more. And, most importantly, be patient. It might take some time for your child to realize that chores are just a regular activity that, in the long run, make life easier for everyone in the household. The first thing that usually comes to parents’ mind when they think about how their children could be doing more around the house is that it would make running the household easier, but this is actually low on the list of reasons why chores are good for your child. When participating in household activities, children see themselves as important contributors to the family’s well-being, especially if they start while young. 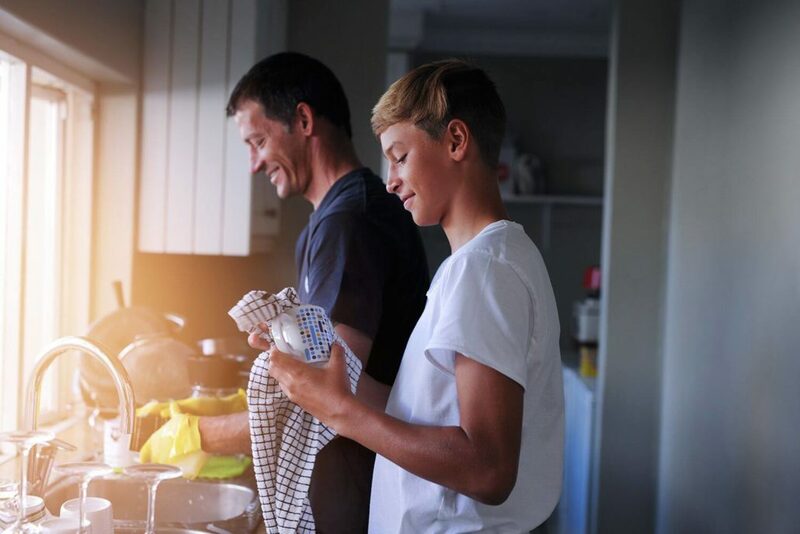 Other than that, chores can be a great way to bond with your child and make them feel more connected to everything that is happening within the family. Running a household is a team project, and getting your child to help with chores will prepare them for working successfully with others throughout their lives. Another benefit for your child in doing chores is that it helps them become more responsible, teaches them self-discipline and gives them a sense of pride and self-worth once they complete their tasks. It also is a great way for them to start managing their time, as they will have to learn how to fit chores into their daily schedules. And if all of this isn’t enough, think about the many ways chores can be useful in bettering certain skills. They can be great exercise and help your child develop both fine and gross motor skills. For instance, doing almost any type of outdoor work not only works up a sweat but can improve physical well-being. Drying the dishes can help them learn how to handle delicate objects. Chores can also help with your child’s numerical and even verbal skills. Ask your child to help write a shopping list, measure and count some ingredients for a cake, or sort the laundry by color to help with their classification skills. The list never ends. You can actually get very creative and make it fun for both you and your child. The case for chores is strong. All you and your child have to do is start doing them. It is never too late. Albernaz, A. (December 8, 2015). Sparing Chores Spoils Children And Their Future Selves, Study Says. Paton, G. (February 20, 2014). Parents told ‘use chores to teach children basic skills’. Responsibility And Chores: Part I – The Benefits of Chores. (December 16, 2012). 4. 6 Big Ways Your Children Benefit From Having Chores (September 10, 2014). If you need any advice on spending time with your children, you’ve come to the right place! Is Helping Your Child with Homework Beneficial? https://nobelcoaching.com/wp-content/uploads/2017/04/chores-for-teens.jpg 1000 1500 Nobel Coaching https://nobelcoaching.com/wp-content/uploads/2017/12/nobel-coaching-and-tutoring-logo.png Nobel Coaching2017-04-03 09:00:272019-04-10 09:21:27DO CHORES HAVE TO BE A CHORE?